There are no Byrne Dairy outposts in the Capital Region, but several stores do carry their products. It isn't hard to find a half-gallon of Byrne Dairy's chocolate milk locally. And lucky for us, the same is true for the ice cream sandwiches. These sandwiches aren't the typical sticky, cake-y cookie layers encompassing a slab of bland vanilla ice cream that you might find in any supermarket frozen section. 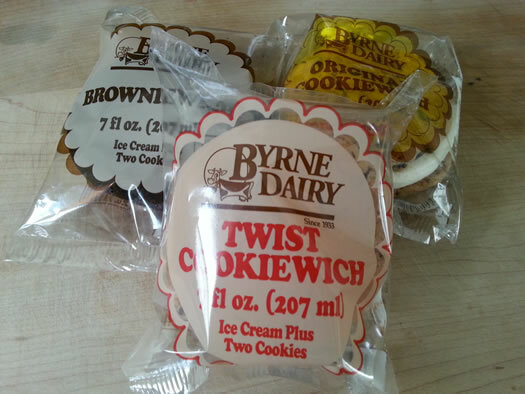 Available in a variety of flavors, Byrne Dairy's sandwiches are instead two large baked cookies (or brownies) that squish a generous swirl of the company's own ice cream. It is ice cream AND (actual) cookies. You don't have to choose between the two. 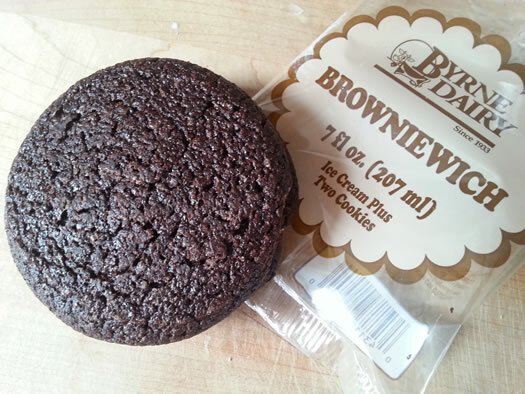 Byrne Dairy refers to the products as either a "Cookiewich" or "Browniewich," depending on the exterior layers. Cookiewich sandwiches ($1.89) feature chocolate chip cookies, while the brownwieches are self-explanatory. Flavors include the classic cookiewich or browniewich with vanilla ice cream, as well as cookiewiches with chocolate ice cream or vanilla-chocolate twist ice cream. The browniewich is also available with raspberry or mint ice cream. The ice cream used on the sandwiches almost has the consistency of soft-serve, making the filling light enough to bite into with ease. It means you can eat it right from the freezer without having to let it warm enough to be edible. 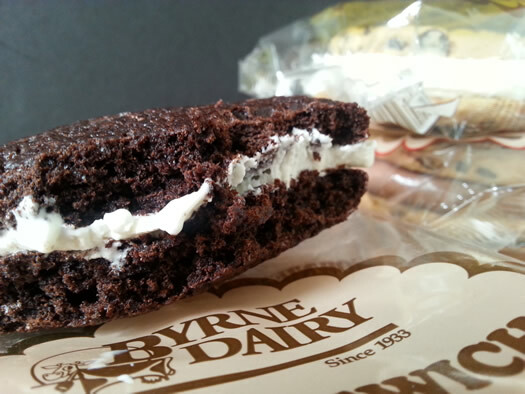 But perhaps the biggest difference between Byrne Dairy ice cream sandwiches as other readymade options is that Byrne's offering feels, for lack of better terms, homespun. And in the Capital Region, we are just as likely to dine based on emotional attachment or personal feeling as we are based on the quality of the thing we are eating. We don't always eat the thing that is qualitatively the "best." Thankfully with Byrne Dairy ice cream sandwiches, we don't have to choose sentimentality over flavor, because they are very tasty, and when I eat one, I find pleasure both on the palate and in my soul. For me, Byrne Dairy brings a taste of nostalgia to dessert time. I grew up on Byrne Dairy, the way my kids are growing up on Stewart's ice cream and milk, and ice cream sandwiches were always a special treat that were indulgent without being expensive. So until Stewart's starts making a comparable product, I'll keep a stash of Byrne Dairy's sandwiches in my freezer. The Byrne Dairy ice cream sandwiches are available at Rite Aid locations around the Capital Region, as well as the Countryside Mart in East Berne, and the Olde Country Store in Schoharie. So where did you buy yours? I've never seen these around these parts, but now I want one! Similar to, but not nearly as good as Biggy Iggy's or Chewie Louies! Nice option. Sounds close to natural ingredients. Hannaford used to have a good ice cream sandwich with real ice cream and no corn syrup cake cover, but it went bye bye. Now there is only the wretched flavored milk ice product with the King Corn coat. Amazing how such a wonderfully simple item can be manipulated more than the genetics of crops. The Rite Aid in East Greenbush doesn't have them. Anyone know where they can be found? I guess I've never seen these because I avoid Rite Aid like the plague, but I can get over my aversion of the chain for a good ice cream sandwich. Unsurprisingly, they don't have them at the Rite Aid on N. Pearl in Albany either. I also checked Rite Aid on N. Pearl - perhaps they are just seasonal items? I checked the 2 rite aids in Clifton park as well as the one in Lansingburg. None have them. I am highly doubtful any Rite Aids in the area carry them currently. I'm sorry for the difficulties you've experienced in finding them. I got mine at the Kwik-Mart in Cobleskill. The PR representative from Byrne Dairy said that products were available at Rite Aids in our area. I will follow-up again with the company and see what I can do about this. Very sorry for all of this. Thank you - I'm glad to hear you are looking forward to trying the sandwiches! I checked for them at the Rite Aid on Central Ave near Manning Blvd in Albany. No luck. Any word on this? I just stopped in at a big RiteAid on the north side of Schenectady and am leaving sad and ice cream sandwich-less. Fortunately I can console myself at Memphis King. I'm originally from the Syracuse area but didn't have a Byrne Dairy in my hometown until this past year. My sister-in-law got me addicted to these ice cream sandwiches over Christmas! I recently found some at Shoprite in Slingerlands. They were in a box of 4 original cookiewiches near Byrne Dairy ice cream. So good! These are now being carried at the Price Chopper/Market 32 in Brunswick!